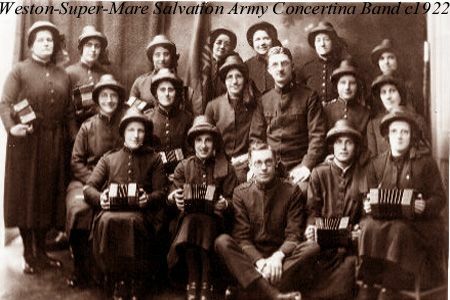 There was a time when a concertina was almost mandatory equipment for a Salvation Army officer. 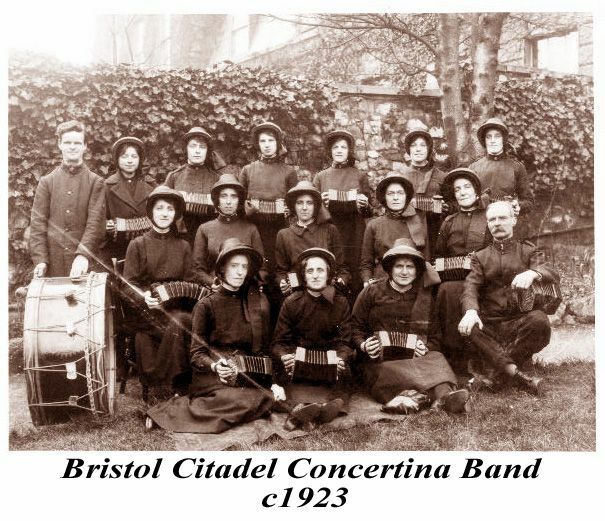 In the instrument�s heyday, between the turn of the century and the Second World War, between a third and a half of all officers in Britain played it. It was said almost anyone could learn to play with just an hour�s tuition. For a meeting leader or open-air evangelist the concertina offers huge advantages over other instruments. It�s totally portable, produces chords as well as a melody line, and the player can sing or speak while he plays. Try that with a trombone! 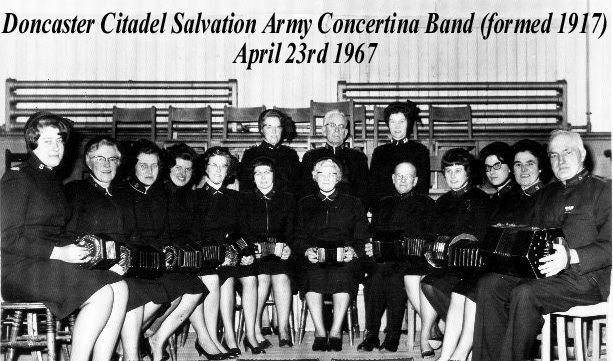 The following post cards come from the collection of Malcolm Clapp and are published here with his permission (permission is also being sought from the Salvation Army, on the assumption that they hold the original copyright to these pictures). They give evidence of an important stage in the life of the concertina, and many of the instruments being lovingly restored and played today would have passed through the hands of band players like these. Many instruments were made especially for the Salvation Army, for instance I myself own a Jones anglo with the letters SA worked into the fretwork of the ends. 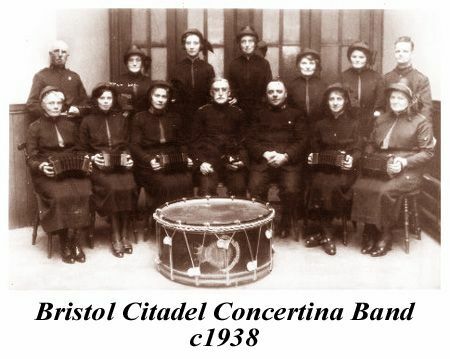 On the week-end of April 22nd, the Salvation Army held a Festival at the Bristol Citadel, the Concertina Bands from Doncaster and Plymouth joining that at Bristol for the occasion. We are indebted to Jim Floyd for a first-hand account of the two days of playing, and to several members for copies of the S.A. Journal - The Musician, which contained a detailed article on the Doncaster Band. 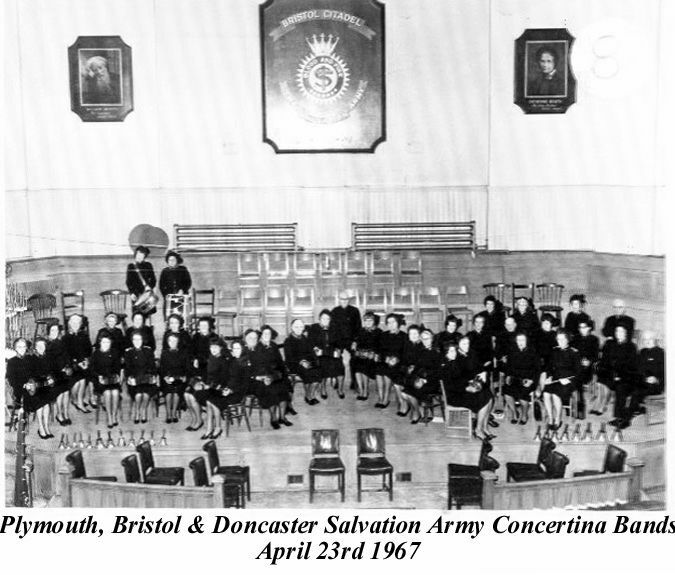 The Doncaster Band was formed in 1917, soon growing to twenty-seven members, but new reduced to fourteen. It uses entirely 'English' Concertinas and plays from brass band parts. 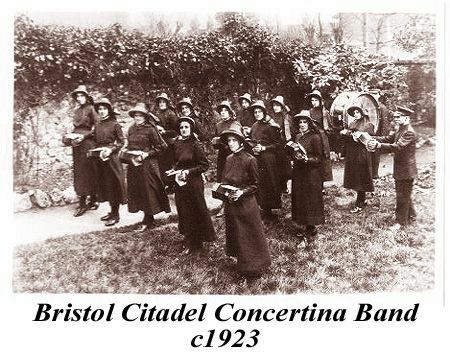 This resulted in the sound being a tone higher, and of recent years players have bad their instruments tuned to correspond with those of the brass band, and in current low pitch, which is a particular advantage for congregational singing, and would enable then to mingle with brass players. 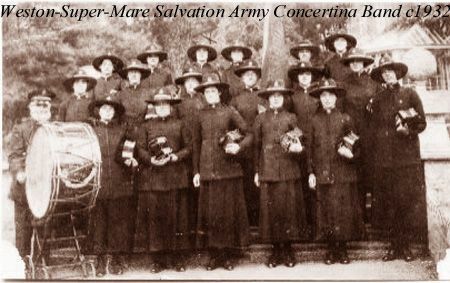 The Plymouth Band was formed in 1892, and now numbers twelve members. Its music is arranged from brass band scores. 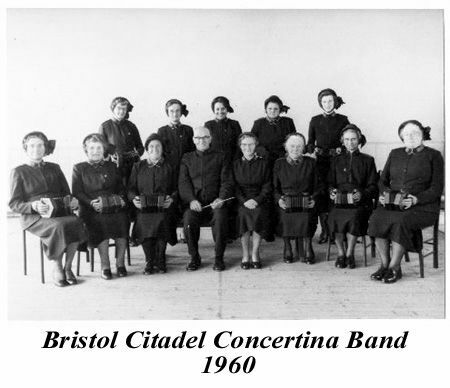 Like Doncaster Band, Plymouth has travelled widely, but has had the unique experience for an all woman party, of playing a programme in Dartmoor Prison. 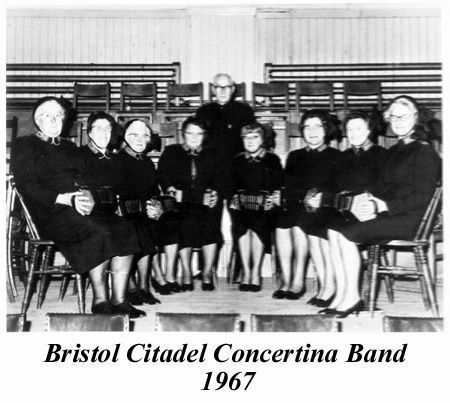 Bristol Band is the oldest dating from 1882, and now with nine members. The music is all specially arranged by the leader, and although the band now confines itself to indoor activities, it plays a very big part in Corps life. 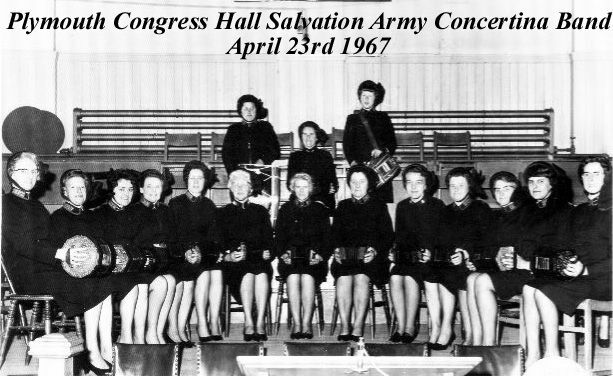 The programmes were spread over two days, each band contributing not only items from its repertoire, but also vocal solos, items on handbells, and duets and trios on the piano.